Summer is a great time of year for most of us, but it can take a toll on your roof. The hot sun can cause more damage on your roof than you may imagine, and it’s important to keep it in the best shape possible during the coming months. Preparation now can help you from having to pay costly repair fees later in the year. Check out these tips to prepare your roof for the summer so that you can take care of your roof. Make sure all gutters and downspouts are clear of any blockages at the start of summer. After the fall and winter, loose leaves or small twigs could be blocking your roof drainage and now allowing rainwater to not flow off the roof properly, leading to big problems. Even if you think the gutters are clear, go and take a check just to make sure – it’s worth it! 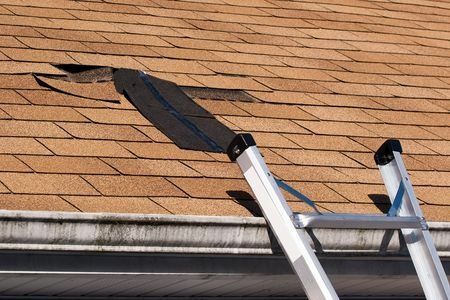 While you’re checking the gutters, give a good look over your roof and assess its overall condition. Are any shingles missing? Are there any cracked shingles? If so, replace these as fast as possible. It’s a good idea, too, to take a picture of your roof each spring so you can see if there are any major changes by comparing photos from year to year. The damage from mold can happen fast, so look for any moldy areas or spots that mold may have already damaged. If you see signs of mold on the surface it could mean that there is an even more substantial growth underneath. Call in a professional immediately to come remove any mold and check for deeper problems before the unwanted mold growth gets worse. Squirrels, birds and other small animals may want to make their home in your roof. They will find any open space, so make sure all areas are covered. This means looking around any attic accesses or roof vents to make sure they are properly sealed and blocked to prevent any small creatures from getting in. Speaking of seals, while the sun can be rough on your roof, so can water, and improper seals that have been worn away by winter weather or seasons or sun and rain can allow moisture to seep into your home. Check over your roof, around any vents and along the chimney line to make sure there is sealant in good condition. If you see an open spot, fill it immediately as strong summer storms can easy bring a lot of water that can quickly pour in through these caps and lead to damage to your roof’s substructure or even the walls and ceilings inside your home. The professionals at Roofing by Bruce can help you out, too. As experts in roofing, we can perform a comprehensive roof inspection, looking for signs of problems and offering repair and replacement services to make sure that your roof is ready for the summer ahead. To learn more or to have us come out and check out your home, call us today at 570-424-7250.